Have You Made It to Red Rocks This Summer? At Summit Riverside Apartments in Littleton, we absolutely love our community! Littleton is an amazing city that offers plenty of exciting things to do, but the best part of all is that we are surrounded by the beauty of Colorado and there’s always something new to see or a new area to explore. One of the most wonderful things to experience is the beauty of Red Rocks Amphitheatre and with it only being about 20 minutes away from our apartment complex there’s no reason not to plan a visit for yourself! But what will you do while you’re there, you ask? As a matter of fact we’ll be diving into a few upcoming events in today’s post. Keep reading to learn more! No matter what you do for fun you’re sure to find something to enjoy about a trip to Red Rocks. Let’s take a look at a few of the events that are sure to be popular that are coming up just around the corner. If you’re not familiar with Film on the Rocks then prepare to have your mind blown. 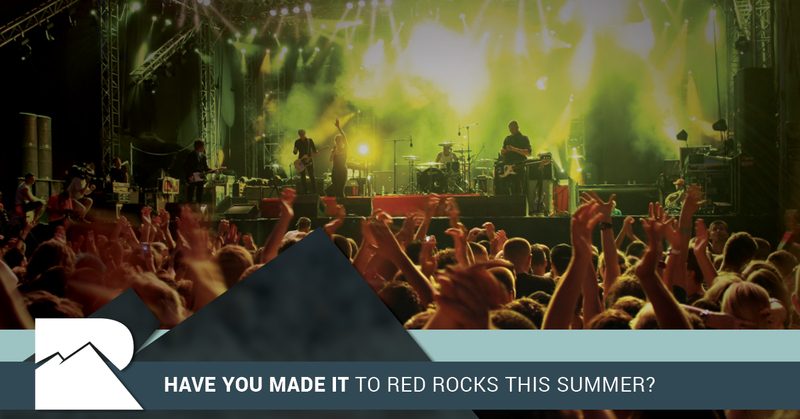 A “a collaborative production of the Denver Film Society and Denver Arts & Venues [that] was created to provide an affordable opportunity for the community to enjoy films and live entertainment at Red Rocks Amphitheatre,” Film on the Rocks is always a blast. The season is already partially over, having shown modern films and classics alike. This year’s movies included Star Wars: The Last Jedi, 10 Things I Hate About You, The Grand Budapest Hotel, Heathers, The Big Lebowski, and Happy Gilmore. The best part of this event is that it’s not too late to enjoy a film this season as well. The Goonies will be shown on August 7th if you’re in the mood for a 1980s classic, or Black Panther is playing on August 13, making it the perfect opportunity to enjoy one of the biggest films of the year (and of all time!) on the big screen. If you haven’t been to a concert at Red Rocks then it’s time to make it a priority. No matter what type of music you like you’re sure to find that there’s something right up your alley coming to Red Rocks in the near future. Upcoming artists include Father John Misty with TV on the Radio on August 15, Nathaniel Rateliff and the Night Sweats on August 22 and 23, 30 Years of Reggae on the Rocks on August 26, Jason Isbell with Aimee Mann and Amanda Shires on September 3, Mac Demarco on September 10, and Beck with Jenny Lewis on September 24 and 25. There are dozens more concerts just around the corner, so if none of the above musicians are quite your style, don’t worry because you can see the full list of concerts scheduled. Although Yoga on the Rocks is over for this season, that doesn’t mean that you can’t do a bit of exercising in one of Colorado’s most beautiful outdoor spaces! Exercising at Red Rocks has become quite popular over the years and you can even bring your pet with you as long as he or she remains on a leash (and as long as you clean up after your pet). If you’re looking for something new, trying your hand at “a challenging workout at 6,400 feet” is ideal for runners who want to mix things up a bit. If you’re a fan of hiking or biking, you can do that at Red Rocks as well thanks to Trading Post Trail and Geologic Overlook Trail which are both located in the park. Plan accordingly because trails are open every day from an hour before the sun comes up to an hour after the sun goes down. At Summit Riverside Apartments in Littleton there’s nothing we love more than being a part of a beautiful and exciting community. Colorado is already the best state in the Union and we strive to offer the best apartments for rent in one of the best cities in the state. No matter what you’re looking for in an apartment you’re sure to love Summit Riverside. Learn more about us here, find out what amenities we offer, take our photo tour, and find the right floor plan for your needs. Once that’s all taken care of, why not pop on in and see us in person? Request a tour today. We think you’ll like what you see and we look forward to hearing from you!